There is a lot of talk about the New Apostolic Reformation, so is it biblical? Apparently, some think that we’ve been given some new revelation and that it’s now time for a “New Apostolic Reformation,” (NAR) but, does it line up with what the Bible teaches about apostles, prophets, and the chief cornerstone, Jesus Christ? I was actually told I was not a pastor but a prophet, just below the level of apostle. I tried to reason with him, but he said the new wine doesn’t fit into the old wineskins, whatever that means. Jesus’ reference about putting new wine in old wineskins had nothing to do with the need for new apostles and prophets and a new reformation. Jesus was talking about the religious traditions of the Pharisees, not about new revelation (Mark 2:18-22). This man told me that he heard directly from God that I was to be a prophet for this New Apostolic Reformation and he was possibly a new apostle. By the way, this is no small movement, as it’s now the single largest segment within Christianity worldwide. This movement started in 2001 and many see its founder as C. Peter Wagner. Although Wagner denies this, his teachings permeate throughout the entire NAR movement. 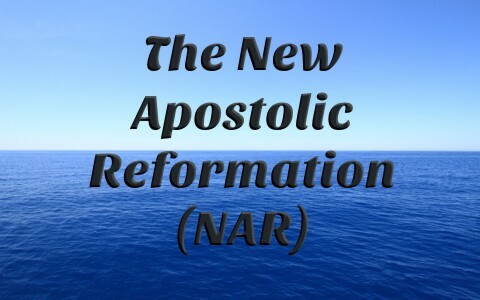 The New Apostolic Reformation (NAR) is a movement which asserts that God is restoring the truths that were lost in the church through the means of the “Five-Fold Ministry,” which is based upon Ephesians 4:11-12 where the Apostle Paul writes that God “gave the apostles, the prophets, the evangelists, the shepherds and teachers, to equip the saints for the work of ministry, for building up the body of Christ.” One problem the NAR has in using this as a source of authority is that it actually says, God “gave,” indicating it was a one-time past event and written in the past tense, just like the faith that was once delivered is (Jude 1:3). Of course, God is still calling pastors (shepherd) and teachers, but it seems impossible to have more apostles. For one thing, there are only going to be 12 pillars in the temple and the twelve apostles will rule over Israel, so there’s one throne and pillar for each apostle, and the most problematic issue is the qualifications for being an apostle. When the 11 apostles were replacing Judas who had betrayed Jesus, they laid out the only possible qualifications for an apostle, and that it must be “one of the men who have accompanied us during all the time that the Lord Jesus went in and out among us, beginning from the baptism of John until the day when he was taken up from us—one of these men must become with us a witness to his resurrection” (Acts 1:21-22). I am old, but not old enough to qualify for that. The New Apostolic Reformation believes that there are now new apostles and prophets being added to the church, and even though I am no architect, I can see another issue; a new foundation over the building which has already had its foundation laid 2,000 years ago. The Apostle Paul wrote, “For no one can lay a foundation other than that which is laid, which is Jesus Christ” (1st Cor 3:11), and no one means no man or woman. As for believers, “you are no longer strangers and aliens, but you are fellow citizens with the saints and members of the household of God built on the foundation of the apostles and prophets, Christ Jesus himself being the cornerstone” (Eph 2:19-20). The stone in Zion was prophesied long ago by Isaiah (28:16), and the Apostle Peter quotes him: “Behold, I am laying in Zion a stone, a cornerstone chosen and precious, and whoever believes in him will not be put to shame” (1st Pet 2:6). The building starts with the foundation, but not without the chief cornerstone, Jesus Christ, or it could never stand. After the cornerstone is laid, the apostles and the prophets secure and finish the foundation. And for the last 2,000 years, you and I, and millions of others “like living stones are being built up as a spiritual house, to be a holy priesthood, to offer spiritual sacrifices acceptable to God through Jesus Christ” (1st Pet 2:5). Now, after 2,000 years of building, some believe we need a new foundation with new apostles and prophets? What’s wrong with the old one? And, how stable is a building that has another foundation laid on it after 2,000 years? Not very! Many come into the NAR movement, just like the Last Reformation movement, to learn the gift of healing or to see signs and wonders, and there is no shortage of people claiming to have raised the dead, healed the sick, and performed many miracles. Of course, God can still work miracles, but I doubt He’d post it on YouTube or want to make it into a training session. Some of their YouTube trainings boast about learning the gift of healing, but clearly, healing is a decision God makes and God enables. It’s not something you learn but something God does through a person, but there is a problem about wanting to seek signs. When “the Pharisees and Sadducees came, and to test him they asked him to show them a sign from heaven” (Matt 16:1), but Jesus said, “An evil and adulterous generation seeks for a sign, but no sign will be given to it except the sign of Jonah.” So he left them and departed” (Matt 16:4). Supposedly we need the “signs of an apostle” and we need new revelations from new prophets to finally propel the church into its glorious state of perfection before Christ returns. This movement seeks to envelope the whole world before Christ returns so that they can present a spotless bride to Christ, but those of us who do not submit to this “prophetic-apostolic” movement will be judged or moved out of the way. It reminds me of the Tower of Babel, where people sought to reach heaven by works and not let heaven reach down and save them (Eph 2:8-9). It looks like an effort to Christianize the planet to establish the kingdom of God ahead of time, before Jesus returns. Is God still raising up prophets today? We know that the apostles and prophets are the foundation, one that was laid thousands of years ago. The author of Hebrews wrote, “Long ago, at many times and in many ways, God spoke to our fathers by the prophets, but in these last days he has spoken to us by his Son, whom he appointed the heir of all things, through whom also he created the world” (Heb 1:1-2), so it was long ago that the prophets spoke and in the last days, God has spoken through His Son (in the gospels), so any one who claims to be a prophet must still be living today, because the prophets came from “Long ago,” however, God warns us about adding to or taking away from God’s Word (Deut 4:2; Prov 30:6; Rev 22:18-19), so when a self-designated prophet tells me something, he or she is supposed to be speaking for God, and when one speaks for God, they are adding to God’s words. Preaching God’s Word is not adding to it…it is unleashing the power found in the gospel (Rom 1:16; 1st Cor 1:18). My concern is, maybe God spoke to him, but which god was it? Is it “In their case the god of this world has blinded the minds of the unbelievers, to keep them from seeing the light of the gospel of the glory of Christ, who is the image of God” (2nd Cor 4:4)? The man who told me he was a prophet and believed I was too, didn’t understand that “when a prophet speaks in the name of the LORD, if the word does not come to pass or come true, that is a word that the LORD has not spoken; the prophet has spoken it presumptuously. You need not be afraid of him” (Deut 18:22). That means you don’t need to listen to him. Is this the “strong delusion” that was prophesied to come? I don’t know, but I do know that this is something we can’t ignore, because as Wagner said, “the NAR embraces the largest non-Catholic segment of world Christianity” and [the] “NAR represents the most radical change in the way of doing church since the Protestant Reformation.”  But it’s not a good change, nor is it biblical, therefore it is incumbent upon us who have trusted in Christ to contend for the faith once delivered (Jude 1:3)and place that gospel against any other message that claims to be the gospel or claims to be a new revelation from God. Read more here: How Can We Recognize False Doctrines? Resource – Scripture quotations are from The Holy Bible, English Standard Version® (ESV®), Crossway Bibles. (2007). ESV: Study Bible : English standard version. Wheaton, Ill: Crossway Bibles. Used by permission. All rights reserved. “What is the New Apostolic Reformation.” Wanda “Deb” Martin. The Wartburg Watch. http://thewartburgwatch.com/2014/11/21/what-is-the-new-apostolic-reformation-nar/ (Accessed June 28, 2017). These movements desire to see God moving in new ways NOW and excitement builds as the congregants anticipate God moving every day. Well, God does move every day but we find Him in the old ways delivered and handed down to us by the original prophets and apostles. Those ways are the tested and proven ways of prayer and the reading of His Word. God’s ways are incredible and He often says, “No” which is His way of direction for our “moment by moments” here upon the earth. We don’t need new apostles or prophets. We are all travelers who will soon have spent our time on this journey which all the faithful have also traveled before us. We will be in the “ever present” presence of the Lord very soon. There will be no future and no past, but the “ever present” now. It is an impossible concept for us to grasp, because of our movement within this time bubble. The “ever present” though explains so much. “Soul sleep” becomes moot because there is no “time” after death so we do not have “years” to wait before the Lord returns. That is how Paul could say, “To be absent from the body is to be ‘present’ with the Lord”. It also answers the predestination/free will debate because God in the “ever present” knew our decision in our “time” bubble of this reality and therefore had known our decision in the “ever present” (our past)and therefore in our language “foreordained or predestined” us to be with Him in the “ever present”(our future) known as eternity(the ever present now, and the ever presence of the Lord). It is too hard for our brains to totally understand a reality devoid of time but my point is that we will all soon(another time word) be with God and all mysteries will be revealed. We will forever be with our dear Lord. I can hardly wait(another time word)! THanks Doc. What is disappointing about these many false prophets and self=proclaimed prophets is that they must not be satisfied that the Word of God is not enough…they need more, so that means the Word of God is not enough…and that’s sad. I am not an advocate for the modern charismatic movement, in fact I believe it to be a growing fulfilment of this false fire…Revelation 13:13,14. That said however, I would still leave room for a modern day prophet, for several reasons. First, Jesus warned that in the last days there would be many false prophets, thus suggesting there may be real ones. Third…history repeats. John the Baptist I believe was but a partial fulfilent of one with the spirit of Elijah to appear in the last days immediately prior to the second coming. If the first coming was glorious with the ‘church’, Israel, requiring a messenger to “make a straight and level path for the Lord”, how much more so does an end-time church so threatened by the heresies and cult moements that are so powerful, including ecumenism, as you illustrate above? Thank you Brendan. Jesus said there will be many false prophets but this doesn’t give His endorsement on having prophets appear for the next 2,000 years. They prophets and the apostles are the foundation as Jesus is the Chief Cornerstone, so we cant’ be putting up more of the foundation after 2,000 years ago and the gift you refer to from Paul is ‘”prophecy” but it doesn’t mean predicting the future but in the context, putting forth the truth of God. Why aren’t you satisfied with the Bible now? Do you really want someone putting words in God’s mouth or speaking for God? Isn’t the Bible sufficient for you and for us? Next post: How Do You Practice The Pure Religion Of James 1:27?